I have been trying to figure out the best way to report on my time at the SXSW Interactive Festival and not coming up with a format I like. I am having this problem because so much of what I saw and experienced could (out of context) be taken the wrong way. So I have decided to “borrow” the Esquire Magazine “What I’ve Learned” format and fill you in on all I can remember. Meeting old and new friends is a blast. Thanks to Rohit Bhargava, C.C. Chapman, Chris Brogan, Steve Hall, Candice Faktor, David Crow, Rannie Turingan, Maggie Fox, Dave Delaney, Gary Vanderchuk, Mike Miner, Marjorie Kase, Christina Warren, Michelle Riggen-Ransom, Grant Robertson, Caroline McCarthy, Baratunde Thurston and about 100 others! Even thought I was at the Interactive Festival and not the Music Festival I still was introduced to some cool new music….like Nouvelle Vague, Lightspeed Champion. 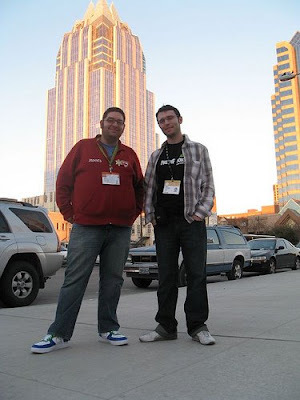 …and finally as a first year attendee of sxsw here are some other random stuff I learned. -You can learn as much in the hallways as in the panels. -You better hit as many parties as you can because they are fun…and the best place to meet folks. -By the last day lots of people knew about FreshBooks….hopefully I had a hand in that. -Say what you want about booze….but it makes some people fun. -The Gingerman Pub in Austin has local made (non alcoholic) Root Beer on Tap like real beer so you can look cool and keep your wits about you at the same time! -SXSWi is probably the only place you can bring a laptop to a party/bar and not look out of place. -Handing out real one dollar bills as a street promotion is uncool. -Handing out promo condoms in the mens room is creepy and can be misinterpreted. …and finally. Most of the really cool stories that come out of sxsw can’t be repeated! I had an absolute blast at SXSW and am already putting pen to paper coming up with ideas on how to make a splash next year. Thanks for the shout out man. It was fun to connect in Austin. What a blast eh?